Lou Andreas-Salomé (née Louise von Salomé or Luíza Gustavovna Salomé) was born in St. Petersburg, Russia to parents of French Huguenot and northern German descent. Her diverse intellectual interests led to friendships with an astounding array of luminaries, including Nietzsche, Wagner, Freud, and Rilke. Andreas-Salomé was a prolific author, writing several plays, essays and more than a dozen novels. It was Andreas-Salome who began calling Rilke "Rainer" instead of "René." Her Hymn to Life so deeply impressed Nietzsche that he was moved to set it to music. She was one of the first female psychoanalysts (a career she maintained until a year before her death) and also one of the first women to write on female sexuality. 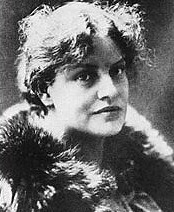 Her book, Lebensrückblic Lou Andreas-Salomé (née Louise von Salomé or Luíza Gustavovna Salomé) was born in St. Petersburg, Russia to parents of French Huguenot and northern German descent. Her diverse intellectual interests led to friendships with an astounding array of luminaries, including Nietzsche, Wagner, Freud, and Rilke.